This past Summer my sister and I each inherited a chair from our Grandparents house. These chairs have been around for as long as I can remember and as long as my Dad can remember too. We had the chairs reupholstered and my chair now sits in my living room. ﻿The upholster was really impressed with the quality of these chairs. He said they were made in Grand Rapids but he couldn't tell by who. It's not surprising that the chairs were made here - Grand Rapids, MI was once known as the Furniture Capital of the World because of the great number of furniture manufacturers. 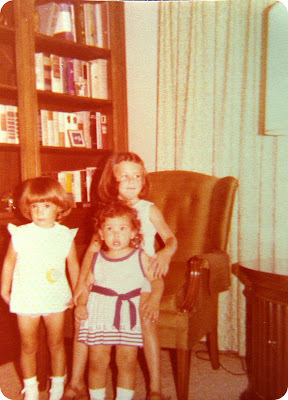 My Grandpa remembers that these chairs were purchased from Klingman's - a furniture store in GR that unfortunately is closing after more than 150 years in business. You might remember me mentioning the chair when I posted about the ottoman I recovered to match the chair. See the small amount of green in the last photo? 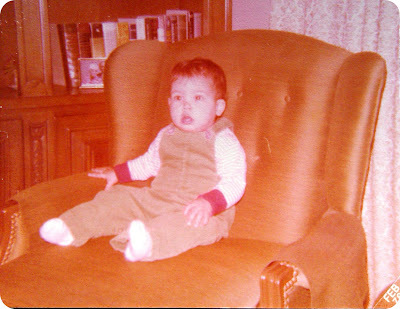 That was the true color of the upholstery on the chair. A pretty color, if you ask me, but after 40 + years you can imagine how worn it was looking! I've considered painting the wood on the chair, but for now, I'm leaving it as it is. It makes me happy to have this piece of our family history in my living room. Looks amazing! And such a neat story too. My grandparents live out in Montague, MI on Lake MI so we always fly into Grand Rapids when we visit! Love the fabric...really pretty chair! I love the story behind the chair! You were just as beautiful then as you are now! You chose a beautiful fabric! The upholsterer did a fabulous job. I love the nail-head trim. Allisa, this chair is beautiful. I love that you and your sister have a chair that you can enjoy that has been passed down to you. 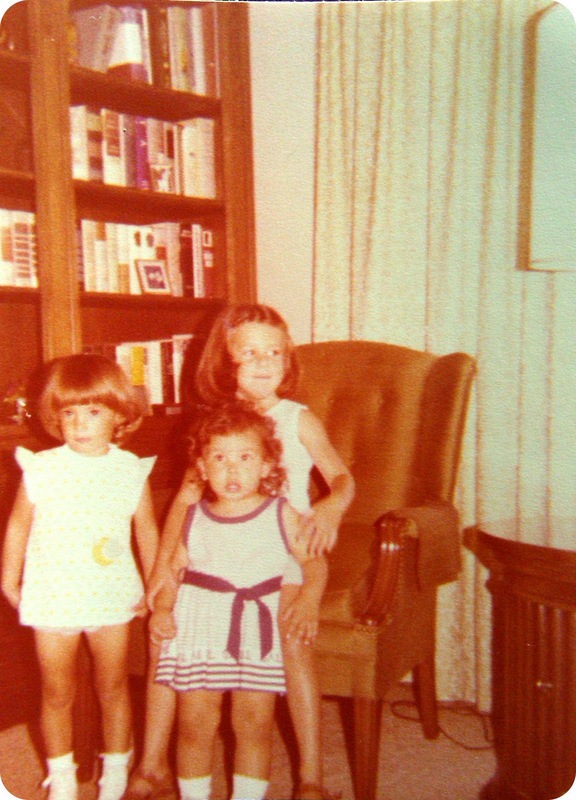 I love the fabric selection, the nailhead trim and the real wood you left as it was. Fantastic job! Great post! I'm a sucker for nail heads. They can add so much class to just about anything. Delightful job. That chair is gorgeous! I love the story behind it. It's so great that you have a piece of family history in your home, and you could make it "yours". Just beautiful. Lovely chair with so many memories. It's a great part of your history. Love the fabric you chose. We have the same table in our living room, though yours looks so much nicer! so great that you could update it and make it look like new again. 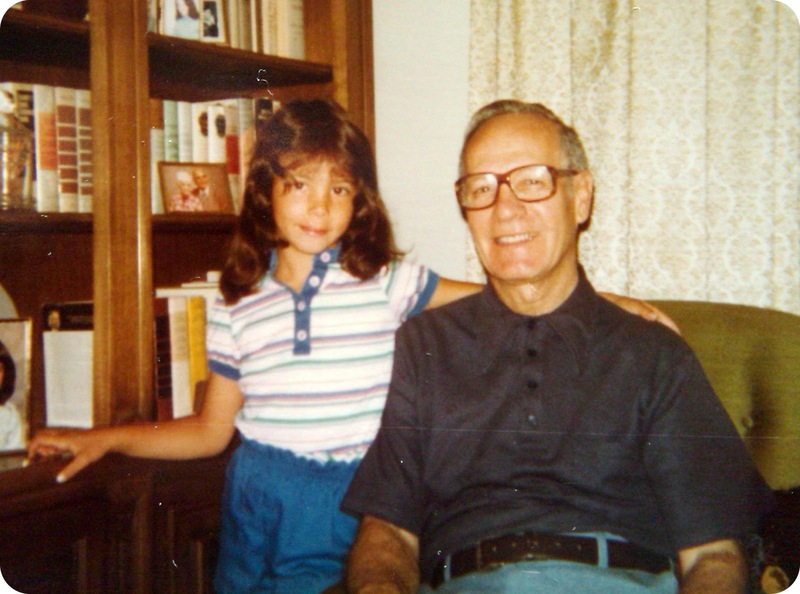 and how special is it that you have photos of yourself as a child with your dapper grandpa! beautiful. What a beauty! Wish I could reupholster a chair like that place! Really pretty! Your chair looks great! The choice of upholstery fabric really brings the chair to life! Oh, I so love that you have those photos. Of course the fabric is lovely and you have such a great sense of style! Love it!! I think that is so very special that you are using this chair in your home! I love the fabric and the reupholstering came out great, but how lovely that you have memories with this piece of furniture! That is so cool. What a beautiful chair, makes it even more special with all the memories. Great fabric choice! The fabric on the chair is stunning! What a great way to preserve a piece of your past and bring it into the future! What a gorgeous chair! I love pieces of furniture that have special memories tied to them, and that chair certainly does. What a great piece! What a beautiful story and a beautiful chair! Love Love Love the fabric!! That chair turned out gorgeous! I love the fabric when you used it on the ottoman but it looks really great on the chair too. So great that you have a story behind it too. The chair is gorgeous, Alissa. What a transformation! I love the fabric you chose. Great story and great heirloom. Your grandma's chair is gorgeous. I bet she would be happy that you are using in your home now. Did your sister pick the same fabric? That looks great! Damn good job! Absolutely stunning! Plenty of life left in that gorgeous chair. Oh, the stories that chair could tell! LOVE the makeover, Alissa. wow I can't believe you did that! (well I probably can) it's awesome! OMG! How awesome is it that you can keep family history in your home with an updated twist!? My husband and I just recently inherited a padded bench and are in the process of picking out upholstery for it! We are so happy to have inherited and can't wait to give it a much needed update! LOVE your chair! The chair looks great and I love that fabric! What a gorgeous renovation! I think the chair looks great as is - don't paint the wood...smile. I love it... it's perfect! Looks amazing! I love old furniture with a facelift. This is such a beautiful chair! Priceless! Your chair looks awesome! My friend gave me a chair she found on the street in Boston AND the fabric for reupholstering it. I don't have a clue how to do it. But it's a chair like yours and I know it will look great when it's done. I'm feeling inspired! They did a beautiful job on that chair! You picked a beautiful fabric too. I love that you didn't paint the wood and I am also surprised. I think my first instinct would have been to paint them... but it looks so lovely as it is. what a great story. and chair looks amazing. they did a wonderful job. I love this! What a unique and beautiful way to have a piece of family history in your house. And that fabric...wow. Ciao Alissa, All the best for 2011. I am back at last catching up on all the posts I missed while I was away from computing. You have been busy, I wish you well with Tasty Tuesdays and look forward to trying some! This has to be my favourite recent post, about the history of your new chair and I love the fabric you have chosen. Love it! The fabric and style are just lovely. I have a similar chair and would love to get it reupholstered. How many yards of fabric did you use and do you mind me asking the cost?